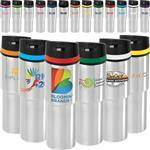 The Groovy double walled travel mug with your custom logo. A modern retail designed tumbler in three distinct metals. 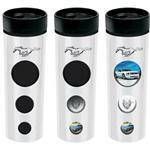 Sleek design and exceptional quality make this a great executive or VIP gift for any industry. 16 oz. 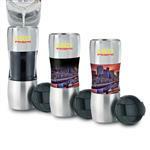 capacity, double wall construction and screw-on, spill proof lid. Stainless Steel Liner. A new but favorite travel mug. Sleek design and exceptional quality make this a great executive or VIP gift for any industry. 16 oz. capacity, double wall construction and screw-on, spill proof lid. Travel Mug.